Tunturi has upped the ante slightly with the Tunturi C35 elliptical cross trainer, giving you the opportunity to purchase a Scandinavian designed elliptical machine with a few extras that can’t be found on the C30 while still keeping the price at a reasonable $1,000-$1,100, depending on where you purchase. The Tunturi C35 elliptical cross trainer gives you everything the C30 does plus a few more features to vary your workout and give you a bit more motivation. 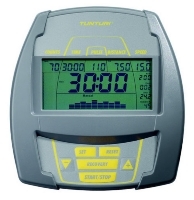 The interesting thing with Tunturi is that they don’t set things up quite the same as elliptical cross trainers manufactured in the U.S., U.K. or Canada. What they call “programs” are a reference to the resistance levels, and these are measured in Nm (Newton meters), with the higher number equaling higher resistance. Profiles are what we commonly refer to as “programs,” meaning pre-set workouts designed to give you different types of workouts geared to vary your routine and help you hit your target heart rate. 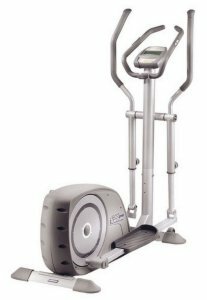 UPDATE: The C35 model has been discontinued and Tunturi ellipticals are hard to come by these days. If you want to see their latest lineup here is a link to the official site. Again, fitness pros are virtually silent on the Tunturi C35. It’s odd, but there seems to be a fair amount of interest from the general public in learning more about these elliptical crosstrainers, but fitness experts just aren’t giving them much attention yet. Buyers do like the Tunturi C35 elliptical cross trainer better than the C30 because the LCD display console offers more useful information, including energy consumption, heart rate, steps and distance. These make all the difference to the average user because they are easy to understand statistics that can help them chart their progress in an understandable way. Is Tunturi gaining popularity in general? Yes. The C35 elliptical cross trainer may be the best example of the company’s attention to consumer input. By adding pre-set workouts (profiles) and providing more relevant information through the console, they’ve given consumers two things they always look for in elliptical machines – variation to avert boredom and a way to track their progress. We still have reservations about customer service with Tunturi – parts shipped from overseas still take too long to get to the U.S. and Canada. But the small footprint and stylish design combined with increased usability mean that the Tunturi C35 elliptical cross trainer is getting closer to the mark.